Warming up the engine, about to take off for a week and notice a leak. on the driveway. Any ideas? Very tough to get to and all shops are closed. Seems easy enough if I had access to it. One shop said return lines often leak, does that sound right? Definitely not well versed in servicing this beast, so any and all tips welcome! In Granite Bay, CA, if that helps. 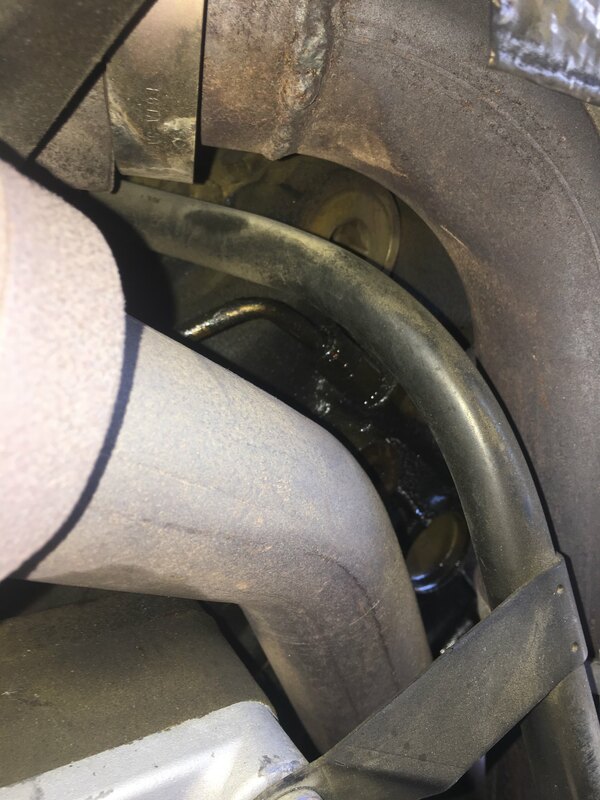 could not see the source, but knew it was coming from the top of the engine. I drove it for awhile before taking it in to a shop. With my leak, it was annoying, but it did not stop me for driving it until i could get it fixed. I'm not clear what we're looking at here. How much oil? Looking in from the cab, passenger side. Felt slight performance decrease when I went up to Tahoe, so hoping its just a minor fuel leak. Can't quite get at where the leak appears to be. Ok, there is a sensor up there, with an oring that is known to go bad. But damned if I remember what it is. It's a super cheap part and 5 minute swap. I believe that is the Return Fuel line from the Fuel Rail. Not sure if there is a gasket...or should be able to loosen and put red Thread sealant and tighten back down. Or tighten the flare fitting ontop. Ive replaced a bunch of orings over the last year trying to isolate a leak. I think the one rally is thinking of is the icp sensor in the front at the base of the driver side head. There's also a one on the underside of the hpop that's notorious for stripping out too. Dieselorings.com has a longer threaded replacement for a good price. There's a good thread on expo that outlines a lot of good ideas for when your in there. I'll see if I can find it. Get a UV dye kit at an auto parts store, add it to your oil or fuel, run the engine and shine the black light in the area of the leak. You will find it instantly. I used this on all of the fuel fittings on the fuel bowl and at the heads when i was doing some maintenance a while back. It needs some time to set but it works pretty good as a fitting sealant for diesel. Also, follow that same line back in into the valley near the passenger side head. There is a clamp that holds that fuel line in place and the vibration of the motor can rub a pin hole in that line. You may want to also investigate the condition of that line around the clamp for preventative maintenance measures. Thanks for all of the info! Ended up having a shop take care of it quick, since we were trying to leave for a trip. Simple leak, $300, ouch!